Today: A cookie for all your gifting, swapping, and impressing needs this holiday season. Do you wish you were the sort of person who kept a tidy, well-planned cache of cookie dough in your freezer, instead of things like near-empty pints of ice cream and fossilized bananas that may, but most likely will not, become banana bread? 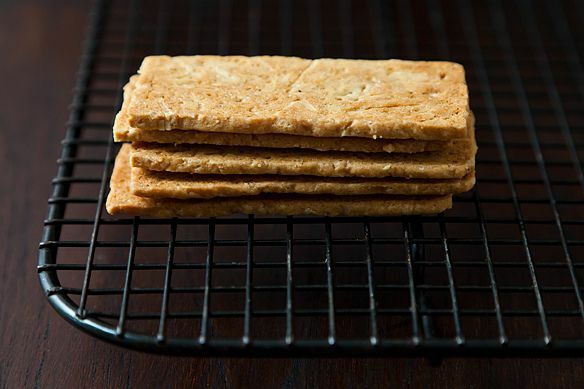 These crisp almond wafers could not be easier to make, or exude more fanciness. Double win. 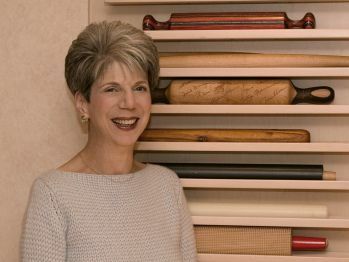 They come to us from Flo Braker, a self-taught baking expert and cookbook author (pictured below), by way of David Lebovitz, by way of our own Rivka -- who tipped me off to their genius, calling them "The Best Tea Cookies on the Planet". Braker considers this her signature cookie, and has tested and refined all chances of failure right out of it. 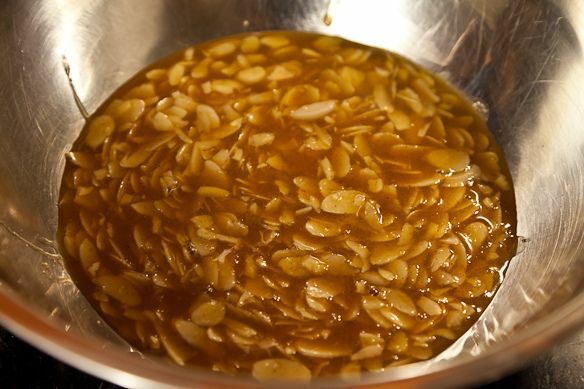 This is all you have to do: You gently melt together raw sugar, butter, water and cinnamon, leaving some of the sugar crunchy, then add sliced almonds and flour. No creaming, no pulsing, just stirring. To get that mod, I-am-so-not-a-drop-cookie shape, you don't have to roll anything out or use a special mold. 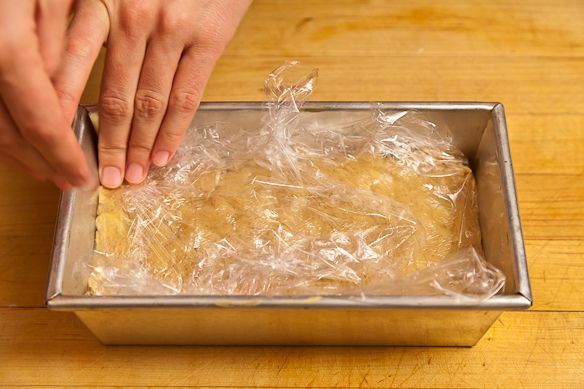 Just press it into a loaf pan (you know, the one you're not making banana bread in) and bundle it in plastic wrap, then chill it till it's firm enough to slice. Or if you're impatient (or planning ahead, you model entertainer), freeze it. Then whenever you're ready for cookies, you can peel them off in skinny tan-colored slices, cross-hatched with snips of almond. A serrated knife is your ally here. 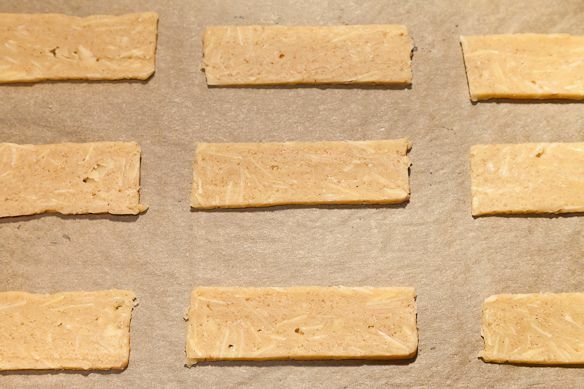 A note: If your loaf pan is angled (like they usually are), it will give you barely sloping trapezoids instead of those perfect tiles shaped like sticks of gum. If you worry about this, you can just shave a little extra off the sides of the block to tidy it up. And because there's no egg in the dough, there's nothing to stop you from really going to town on the scraps. Then you just bake, flipping once so they brown up into wands of caramel, brown butter and almond that snap under your teeth. They're dry and buttery-crisp without being too fragile, so they'll ship well cross-country or pack up neatly in a tin for a cookie exchange or hostess gift. But as Rivka points out, the best part is you can also slice off a few cookies whenever you see fit. "It's a great arrangement ... I err on the side of caution and bake up about 10 at a time — you know, just in case." It's a good thing I can cut some more to bake tomorrow because those baked today are almost gone and we haven't even had dinner yet :). And the smell of them baking - oh my! My bench knife/ pastry scraper made quick work cutting the thin slices this cookie recipe calls for. 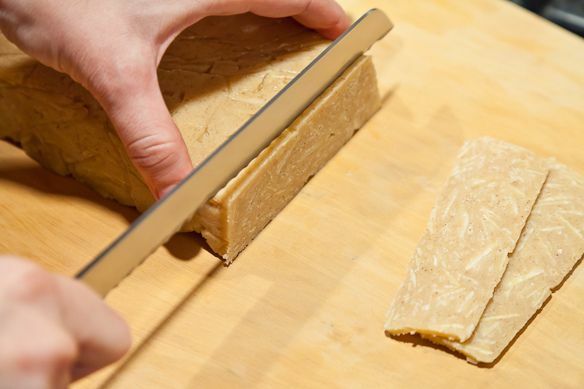 It neatly cut through the cold hard dough and almonds. Flo Braker is the BOMB! 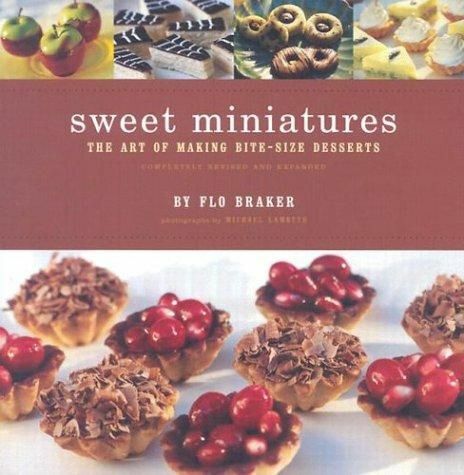 How could I have left her book Sweet Miniatures off of my best 10 list. Sorry Flo. These cookies are similar to the ones they sell in Bethlehem PA. Thin crispy and addictive. Wow! These are really delicious, especially with a hot beverage. So glad I tried them and they are really pretty easy to make. Made these - lovely cookies. A couple tweaks: I threw in pistachios as well as the almonds - about half and half. The pistachios create pretty green flecks throughout. Also, painted about half the batch with melted dark chocolate on one side of the cookie. The chocolate transforms the cookie into something else completely, (relative of chocolate covered biscotti), but is also very good. My husband, however, really liked the pure tea cookie without chocolate. So both ways - great! Kristen, I baked a batch of these this afternoon. They are exactly as you described. The batter is SO EASY to throw together. After chilling, I was able to cut very thin and uniform rectangles that make me look much more exacting than I really am. They taste wonderful to boot and I am taking them to a cookie exchange this evening. Thanks for a great recipe. Thanks everyone for your great comments -- I hope you try these beauties, and please report back if you do! I know that you have done this recipe over and over to get the right proportions, but I have a friend who cannot tolerate gluten. Have you ever done these gluten free and if so, what type of flour have you used? I have an all purpose gluten free and I also have several mixes that I made up from the CIA's gluten free baking cook book. If you are familiar with that cookbook, perhaps one of those mixtures would be better. 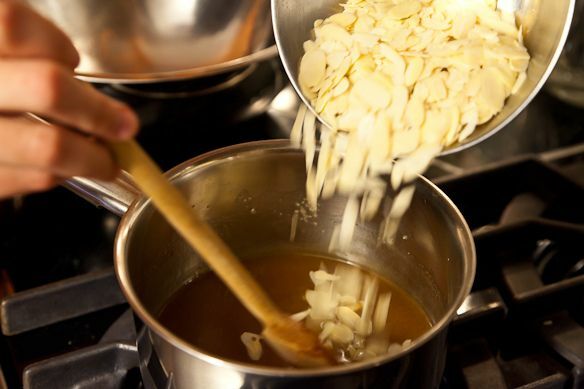 I would hate to waste all that butter and almonds messing around with this recipe to get this done right. I know that my friend would just LOVE these cookies and I would love to make them for him. Sorry creekpaddler -- I'm not familiar with the CIA's gluten-free formulas, but I'd suspect that you'd be okay using either. 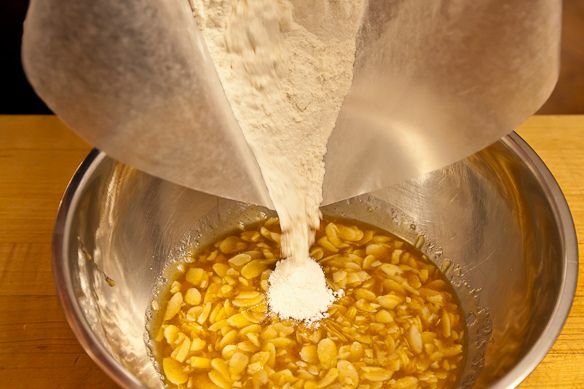 The dough is only stirred together briefly, so there isn't much gluten development in the original recipe, and much of the texture derives from the crunchy sugar and almonds. The dough wouldn't go to waste, of that much I'm confident! GF is great for cookies. 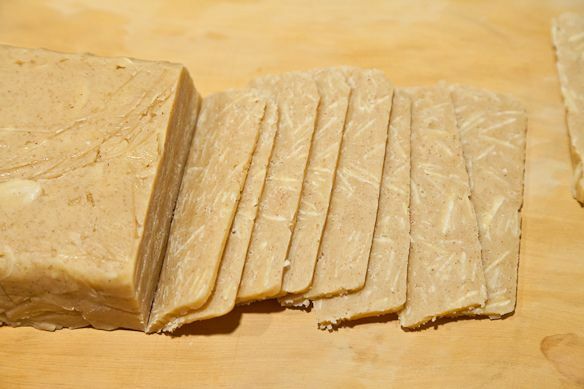 They don't need gluten development and structure and in fact are more tender without it. Pastry or cake flour is a lower protein flour so your GF flour will do well and you don't have to worry about GF pastry flour. 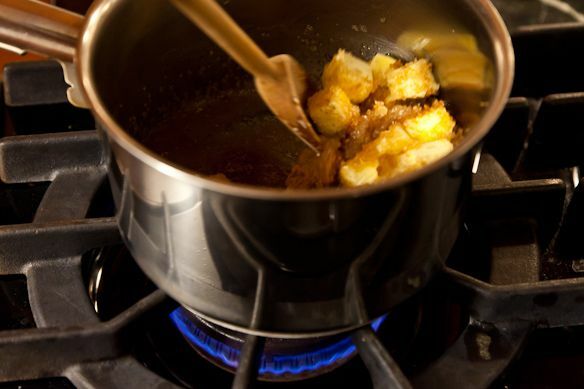 Starches crisp up nicely and your GF mix will likely have a number of starches. Beware of GF flour mixes with a lot of bean flours in them as they can sometimes taste unpleasantly "beany" Otherwise this seems like a great candidate for Gluten free. 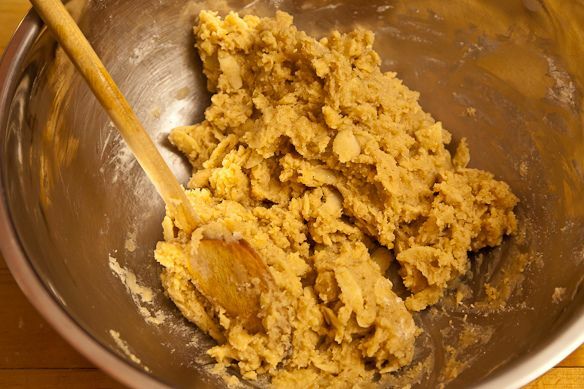 These cookies are amazing, easy & have a great yield. I'm trying another batch today swapping out the cinnamon with my favorite spice...cardamom. You've Sold me on the cardamom! fantastic suggestion! I love the mere idea of these. Brilliant. Great point -- our tech team has a lot on their plates right now, but we'll definitely keep this in mind. It would be great to have the article and the recipe more in sync. These are my favorite, favorite tea cookies...remind me of my childhood...mmmmmmmm...sweet, nutty, crunchy goodness! Thanks so much for posting the recipe! Thank you, Thank you, Thank you! I was in Orvieto in September and had an incredible thin cinnamon almond cookie from Dolceamaro Gelateria and Bakery. It was the best thing I ate all day! I have been wondering how I could find a similar recipe and you have come to my rescue with another genius recipe. I'm very excited to try them out. I was under a rock on Friday, but catching up now, I'm thrilled to see these cookies featured in my favorite Food52 column. They really are the best tea cookies on the planet. Thanks, Kristen, and hope everyone loves these cookies as much as I do! 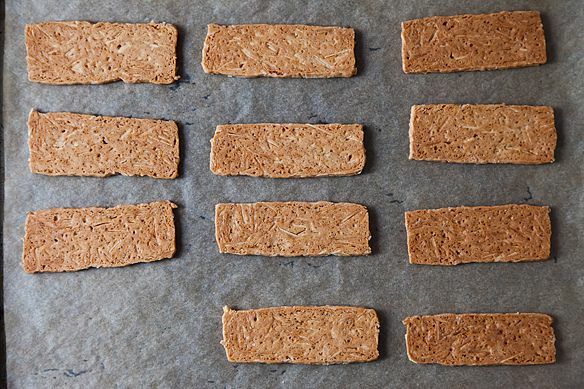 These sound SO good - a slice-and-bake praline. Genius indeed. Thanks, Kristen! These are fantastic! So easy, so elegant. Not too sweet... Just perfect! Oh my, oh my, the first batch just out of the oven...and cool...and the first taste...typically don't use omg but OMG! what goodness and joy...turn on the holiday music. I don't think I can express how happy it makes me to see this recipe. These are my favorite cookies of all time! I buy them in Belgium and wherever else I find them and had after much dedicated searching had despaired of ever finding a recipe for them. I think I now have it - will be making today. THANK YOU!